This is why synthetic biology is astounding. 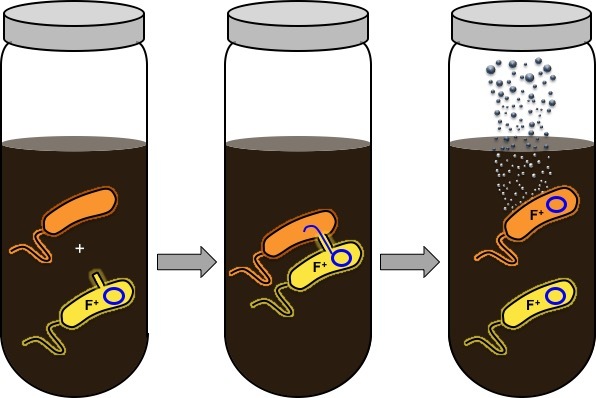 Scientists can now play Big Brother to microbial communities through new gas biosensors that can “see” into soil. Furthering technological advances in one of humanity’s oldest trades. Rice University researchers are using genetically engineered bacteria that release methyl halide gases to monitor microbial gene expression in soil samples in the lab. After an engineered bacterium receives genetic information from another bacterium, it releases a gas to “report” the transaction. Researchers can monitor processes in real time without having to actually see into or disturb a lab soil sample. The new technique can work the same way as fluorescent reporter proteins, which track protein expression and other processes in biological systems. The study describes a new tool to study how microbes trade genetic material in the environment, according to Earth Science professor Caroline Masiello. She says the process of horizontal gene transfer controls a lot of things that are important to humans either because they’re good—it’s how rhizobia trade the genes they need to fix nitrogen and support plant growth—or they’re bad—it’s how bacteria trade antibiotic resistance in soils. The new gas biosensors can be used to study nitrogen fixing in agriculture, antibiotic exchange in wastewater treatment, gene transfer in conditions where nutrients are scarce, and the relationship between gene expression in soil and the release of greenhouse gases. Scientists expect they will soon be able to test agricultural soil samples to help fine-tune crop growth through more efficient watering and fertilizer use.